It's the last show of the calendar year so that can only mean one thing: Harry Doupe! It's a tradition dating back all the way to last year. Well, that's when we codified it. He appeared with us on Dec. 29 last year. The year before it was June 17. But the year before that, in 2011, it was Dec. 18. And his first live visit to the studio was in 2009 on Dec. 27. So when we recognized the trend and realized most of his visits were late in December, we made it a rule. And there's no one better to end the year with because Harry, a standup comic and producer, has an opinion on everything and keeps his finger on the pulse of the comedy world. He also has, without question, the best memory of anyone I've ever met. So we'll rehash the year in comedy and, of course, talk about other stuff. Join us, won't you? We're on Vancouver's Co-op radio CFRO 100.5 FM at 11 pm. Also available online at coopradio.org and on radio apps aplenty. 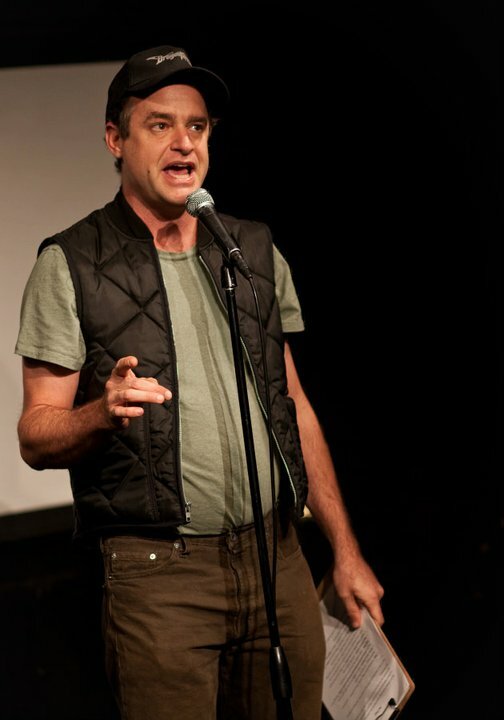 Here's our Christmas present to you: Matt Besser talking comedy (and music) on What's So Funny? Mostly comedy, though, because that's what he does best. Besser is an improviser, actor and standup comic who also happened to cofound UCB Theatre. He tells us here why "if then" is better than "yes and," explains why they don't pay performers, and throws out more sports analogies than cheerleader throws out t-shirts from a cannon. We reminisce about Steve Martin and Andy Kaufman. And I stick my big foot in my big mouth on the subject of Tim Meadows. So start opening this gift by clicking on the gizmo below. Should that not work for you, you can always find us at all the usual podcast repositories like iTunes, Stitcher, PodcastLand, etc. etc. Last week we had Ken Lawson on teaching us improv games. Tonight we've got Matt Besser talking the big picture. Professor Besser loves to talk comedy and we love to listen. The co-founder of the Upright Citizen's Brigade (UCB) was in town recently to record an episode of his podcast improv4humans with the Sunday Service folks. He was nice enough to sit down with me for an hour before his own show and we've got the fruits of that labour for you tonight. Say yes and listen, won't you? If you listen, then you might know what this sentence is all about. We're on the air at 11 pm in Vancouver on CFRO 100.5 FM. Livestream us at coopradio.org or whatever radio app you've got on your device. This episode was a whole lotta fun even if I sucked way more than usual. You see, Mr. Ken "Birdman" Lawson, improviser extraordinaire, put my manservant Colleen and me through the improv wringer. He taught us and led us through several improv games, much as he would at the Improv Comedy Institute on Granville Island. Colleen was a natural. Me, not so much. It's harder than it looks, people! But he sure is encouraging and positive, which is why I'm releasing this episode to the world. Have a listen here. If you don't see the gizmo below, it's your server or your phone. Fret not: the show is also available at iTunes, PodcastLand, Stitcher, and a bunch of other places, too numerous to mention. Tonight we go live in studio with Ken "Awesome" Lawson. It's his third appearance on What's So Funny? I had forgotten he once came in with the Comic Strippers. Tonight, though, he'll be keeping his pants on (we hope). 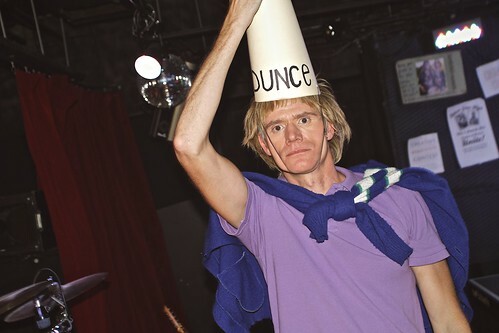 Lawson, a longstanding member of Vancouver TheatreSports League, also teaches the art form at the brand new Improv Comedy Institute on Granville Island. He's going to come in tonight and tell us about that and maybe run Kevin* (aka Colleen) and I through some training. I can't speak for Colleen, but I might very well be the worst student he has ever faced. We'll see how he does. Regardless, it's always fun when Lawson visits. We are on the air at CFRO 100.5 FM in Vancouver at 11 pm tonight. You don't even need a radio to listen to us as we stream worldwide at coopradio.org and on apps and devices and things like that. Join us. December 9, 2014, Montreal – AEG Live Canada and Just For Laughs are thrilled to announce that standup comedian, actor and writer Bo Burnham will kick-off his 24 city North American tour dubbed Make Happy Tour with a performance in Vancouver on Tuesday, February 24 at the Vogue Theatre. In 2008, a young Bo Burnham performed at Just For Laughs on Amp’d the Music Show which caught the eye of Judd Apatow and led to Burnham signing a development deal with the famed director. Burnham became the youngest person to ever record a half-hour Comedy Central special at the age of 18. He has released two hour-long specials since then: Words, Words, Words in 2010 and what. in 2013. The latter, what., was released on Netflix and Youtube simultaneously (a year later, it has received 6 million views on YouTube alone). Bo recently created and starred in the MTV series Zach Stone is Gonna Be Famous and wrote a book of poetry,EGGHEAD, which became a New York Times Bestseller. Bo's live shows are a unique blend of stand-up, music and theatre. A complete list of Bo Burnham’s North American Tour can be found at www.boburnham.com. December 9, 2014 (Vancouver, BC) - It's that time of year again! NorthWest Comedy Fest is proud to make their first line up announcement for 2015 with special headlining performances by Craig Ferguson, Maria Bamford, Doug Benson, The Debaters, Hannibal Buress, Moshe Kasher plus the return of our stellar Comedy Club series with multiple shows by Ali Wong, Brian Posehn and Todd Glass. All shows go on sale Thursday December 11 at 10am PST at northwestcomedyfest.com. 2015 boasts the beginning of a beautiful friendship between NorthWest Comedy Fest and comedy festival heavy hitter, Just For Laughs who are lending some of their booking prowess to our Fest out West. If this year’s announced lineup as well as the surprises we have up our sleeves, are any indication, the relationship is off to a stellar start. NorthWest Comedy Fest has also partnered up with the Vancouver International Film Festival (VIFF) and will be presenting a special series of currated film events at the Vancity Theatre including A Tribute to Robin Williams and An Evening of Comedy Short Shorts. Description: Who likes short shorts? We like short shorts. The NorthWest Comedy Fest and VIFF are proud to announce An Evening of Comedy Short Shorts a delightful hodgepodge of original Pacific Northwest submissions and VIFF curated comedy pieces from up and down the Left coast. Mark Forward opens up! The Toronto actor/standup is a "ridiculously private" guy but we got him talking. He told us about his three years on CBC-TV's Mr. D and how that ended. That's a scoop, by the way. He also talked about being an overly emotional kid and going to therapy and how that made him a better person. Or at least a less angry one. But we talked about all sorts of other stuff, too, including poop, germs, Paul F. Tompkins, Jon Dore, Patton Oswalt, Greg Evigan, Matt Billon, Graham Clark, Dave Shumka, Norm Macdonald, Rob Ford, Bill Cosby, and journalists. It's guaranteed fun: 100 percent! Listen now. (That's a suggestion, not an order. I can't control you.) If you don't see the gizmo below, it's your server. But we're also on iTunes and all the usual podcast places. Go find us. 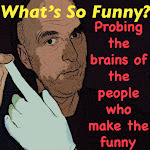 Tonight Mark Forward guests on What's So Funny? Is it live or is it Memorex? You be the judge. The Toronto standup was headlining the Comedy MIX a couple weeks ago and he sat down with me. Or did he fly back just to do our show? Maybe he's here and he just doesn't want to be bothered by paparazzi so he wants to leave the impression this is recorded. You'll never know. Maybe you know Mark as Mr. Leung, the seething school librarian, on the hit CBC sitcom Mr. D. Maybe you recall him from The Jon Dore Television Show. He's also the host of Joke or Choke, which will air on the Comedy Network on Dec. 12. Just a single episode but maybe if enough people watch, they'll pick it up for a season. We'll talk about all of the above – and more! – tonight at 11 pm. Or will we? Maybe. I'll just have to see how it goes. Tune in to 100.5 FM in Vancouver, or find an app that plays radio stations, or livestream us at coopradio.org.